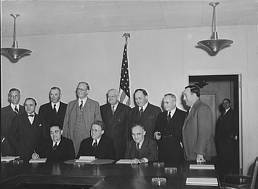 When the U.S. entered World War II, Roosevelt asked Graham to address labor problems in the defense industry as a member of the War Labor Board. Graham fought for his understanding of workers' rights but disagreed with union leaders who wanted to institute closed shops. Wartime service gave Graham two full-time jobs—running the university system and tending to labor issues.